In 1977, the year of Queen Elizabeth’s Silver Jubilee, Elvis’s death and the release of Star Wars, I was just sent off to Enfield Grammar School for the start of my secondary education. The big story around the playground at that time was the strange goings-on in a house in Brimsdown, a part of Enfield. 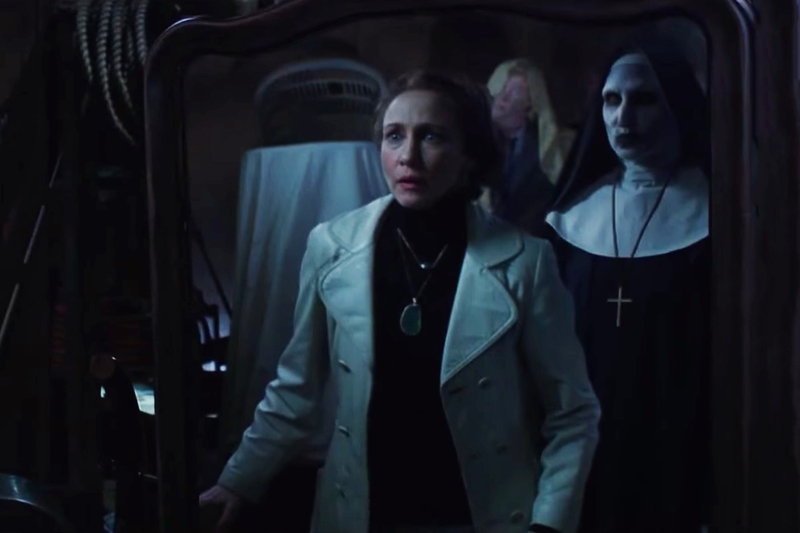 These activities have been the subject of books and a recent TV series but now Hollywood have decided to turn their attention to it, with a sequel to the successful 2013 horror, The Conjuring. Would this be an intelligent examination of the story dubbed The Amityville of North London? Or would it be an overblown tick list of modern horror films? Guess which one it is. Ed and Lorraine Warren, the paranormal specialists, have just finished their investigations into the Amityville horrors and are asked by the church to travel to North London, in order to see if a poltergeist claim is real. Arriving in Enfield, they discover a house belonging to the Hodgson family; Peggy and her four children. Janet, one of her daughters, seems to be the vessel for the ghost of the elderly gentleman who lived there before they moved in. As Ed and Lorraine start uncovering the truth, a darkness starts to loom over them that could lead to horrific consequences. I was a huge fan of the original film, which, while delivering all the usual modern horror trappings, was surprisingly creepy and had some decent scares. So I was hopeful for this new film, especially as it was set in my childhood hometown. Sadly, this isn’t as good as the first film, mainly because instead of being subtle with the shocks, it is so over-the-top it is almost laughable. Director James Wan has become a master of this ghost stories yet even he seems to have gone all out with the figures in the shadows, slow-moving camera signaling disaster ahead and the whole “quiet, quiet, LOUD!” form of scares. While a few moments were effective, this became a little wary for a film that lasts over two hours. Factually, there were errors all over the place that became more of a distraction. The children leaving Enfield Grammar school, the same school that I attended in 1977, which was and still is an all boy’s school. A scene in which a sound operator points a microphone at the open back door so we can hear the sound of crickets chirping. In North London. In December! The actual events have been fascinating many for years, yet here they seem more like a cross between The Exorcist and Poltergeist, with the Warrens battling Demonic forces ranging from an evil nun (looking like Marilyn Manson) to a crooked man straight out of a Tim Burton movie, to the elderly gentleman who died in the house, in a beaten up chair we are expected to believe was bought along with the house, as well as the worst case of dry rot ever seen. Let’s not even go near the giant cellar that could be a whole series of other rooms as well as the dirty house I have ever seen in my life. Doesn’t anyone clean those tiles? To say I was massively disappointed in The Conjuring 2 is an understatement. After the terrific work on the first film, this has all the whistles and bells that will make audiences jump but none of the smartness that filled the first film. And anyone from Enfield will sit and wonder why Hollywood couldn’t come to town and get their facts right.